DARE Camp. Quincy Police offer this camp each year for 5th graders across the city. Students are treated to summer’s best: day trips to amusement parks, summer games and meet-and-greet sessions with Quincy police officers of all ranks, from the marine patrol, to detectives to the chief. The Quincy Police bike patrol leads one of the most popular sessions. Officers answer questions on a wide range of topics, from bike locks to safety vests, riding with friends and other topics. This year, much of the session focused on the wearing bicycle helmets to prevent concussions and head injuries. After the talk, students each received a free bicycle helmet from Breakstone, White & Gluck’s Project KidSafe campaign. Quincy police officers showed them how to fit the helmets and stressed the importance of always wearing one. Children from the Germantown Neighborhood Center visited the South Shore YMCA for the basketball camp. The camp teaches basketball, but many lessons focus on good decision making off the court. One lesson focused on fire safety and prevention, with a visit from the Quincy and Weymouth fire departments, along with a Norfolk County deputy sheriff. The Quincy Police Department’s bike patrol brought the lesson on safe riding, then gave away free bicycle helmets from our Project KidSafe campaign. Read this article in the The Patriot Ledger. In a few weeks, students will be pulling out backpacks and getting ready for a new school year. In Quincy, students who live within a mile of their school must generally be dropped off by parents, walk or ride a bicycle. Many of them will ride. 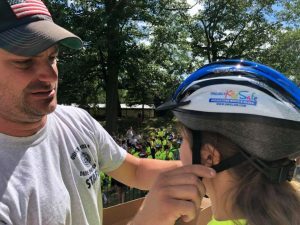 We hope the good efforts of the Quincy Police Department, combined with the bicycle helmets donated by Breakstone, White & Gluck and our Project KidSafe campaign, will help steer students toward a safe school year. Breakstone, White & Gluck, a Boston personal injury law firm, represents cyclists, pedestrians and others who have been injured in car and truck accidents. Over the years, our attorneys have seen cyclists who have suffered devastating head injuries. With the number of cyclists growing in Boston and other communities, our firm set out to reduce the risk of concussions and head injuries. We began with children; by teaching children to wear helmets early, we hope to develop a life-long habit. This takes more than a free bicycle helmet. It takes positive reinforcement on all fronts, from parents, other students and respected community members such as police officers and teachers. Research supports this view. In 2018, the American Academy of Pediatrics reported children are less likely to wear helmets when they ride with other unhelmeted children. But children were twice as likely to wear bicycle helmets when other children wore them or other adults wore them.